WriteOnCon 2019 is just around the corner! So here’s everything you need to know about accessing all of the amazing events and conference content. You can check our schedule to see the full line-up for 2019. And then right here, we have the details on how to get to all these cool events! Attendees who have not purchased admission will be able to access only our keynote and showcase events. Keynotes are posted at the opening and close of each conference day — there are six in total. We have selected six of our favorite topics, which we hope will be useful and inspiring to everyone! Showcase events take place at intervals during the day. These were recorded as public live events in the weeks prior to the conference and the archived video is being shared again with attendees here. Both of these event types will be found on the main WriteOnCon blog. Purchasers of General Admission will have access to only our prepared events (plus keynote and showcase events). These include our blog, vlog, and podcast events — all 60 of them! Our contributors have created some incredibly helpful and eye-opening posts on topics ranging from writing advice to career-building and the publication process, so there’s lots of great stuff here to help you on your writing journey. These events will be on the conference page. You can also access all events from their direct links on the schedule. Those who bought Full Admission will have access to all of the above, plus the live events. We have 42 live events lined up over the three days of the conference — one every hour, on the hour! These include Q&A sessions with industry professionals (authors, agents, and editors), pitch sessions, and even live workshops. These events will be on the conference page and the live events page (you can catch them on whichever one you fancy), and also direct-linked from the schedule. Everyone with Extended Admission will receive exactly the same content as the Full Admission. However, while both General and Full admissions will close at the end of the day on February 17, Extended Admission attendees will be able to access content until March 10. And finally, attendees who splurged for Time Traveler Admission will enjoy the same benefits as Extended Admission, plus exclusive access to all archived events from WriteOnCon 2018 and 2017 on our special time traveler page. The forums will open on February 1 and will be actively moderated through February 13 (though you are welcome to continue using them beyond that date). SUBMISSIONS FOR LIVE PITCH EVENTS will be accepted ONLY in specially-designated threads on the forums boards from February 5 to February 7. For more information on how the forums work, please see our Ultimate Guide to the Forums. All conference events can be found at the Conference Events link in the navigation bar. You can also access them through direct links in the conference schedule. All events are listed, but you will only be able to access the ones that you bought admission for. Live events are accessed through our Live Events page or directly from the schedule. Only Full, Extended, and Time Traveler Admission attendees will be able to access the events on this page (though everyone can see a preview of the posts). Speakers will be taking their questions from the comments left on their event’s page. These comments will be pulled by the moderator; inappropriate content/language will be removed and duplicate questions may be combined. You will need to be logged into your WriteOnCon account to leave a comment on the post. For more detailed information about these events, please see our Ultimate Guide to Live Events. If you have not yet registered, there’s still time! We will be accepting General and Full Admissions right through February 17, and Extended Admissions until March 10, which are the days when these respective admissions expire. You can register here. 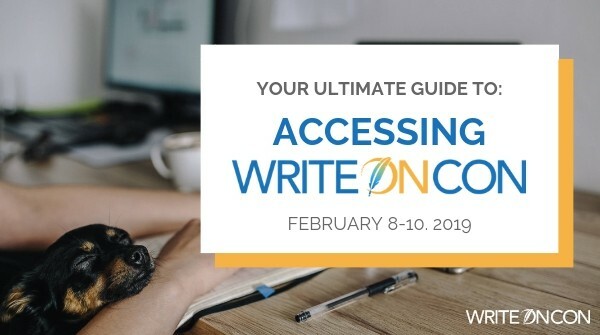 We are incredibly excited about what we have lined up for you during WriteOnCon 2019! We hope that WriteOnCon helps you improve yourself as a writer, and also leads to some wonderful and lasting new friendships. I just learned about your conference today, March 31st. I would like to be able to access some of the conference material, however, despite the home page saying that is still possible, other places indicate that the material – even at the time traveler level – will not be accessible after March 10th. Please let me know if I can access any of the conference material, of if all I can do, at this point, is to join your mailing list. Thank you. Hi, Charlie! So sorry you missed this season! Admission is fully closed now, though we are working on some neat early offers that will go up around September or October. In the meanwhile, feel free to sign up for our mailing list here. Thank you!